To say the world has been eagerly awaiting a new trailer for Peter Jackson’s “The Hobbit: An Unexpected Journey” would be an understatement. While the first trailer debuted online nearly an entire year before the film’s release date, anticipation has been raised high and any news regarding the film has been highly sought after. Starting off with a voice-over by Ian McKellen, who plays Gandalf, we quickly jump into the storyline and action. I believe that this trailer gives a far clearer view of the overall storyline we are going to be seeing in this first film than the previous one did. Thorin (Richard Armitage) is leading his band of Dwarves on a glorious adventure to reclaim the Lonely Mountain and within it the vast treasure guarded by the dragon Smaug. 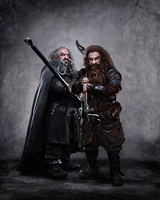 Gandalf convinces the Dwarves that Bilbo Baggins (Martin Freeman), being a small Hobbit, can be a help their quest as he can sneak around and go unseen and therefore he should join their ranks. Early on the journey, they encounter trolls and wind up in Rivendell, where we see Elrond (Hugo Weaving), the King of the Elves, and Galadriel (Cate Blanchett). We meet Radagast (Sylvester McCoy) and see his love of animals and the ominous line he delivers: “A dark power has found a way back into the world.” Eventually, the group has to deal with goblins and is driven deep underground where Bilbo gets separated from his companions, finds the Ring of Power and has his first encounter with Gollum (Andy Serkis). While it is exciting to see the vast landscapes and be taken back to Middle Earth once again, this second trailer shows a more comical side than the first one did and while it boasts a bounty of new characters and terrifying creatures, it seems they have chosen to highlight the humor of the group, the epic scale of the Stone Giants and their game of hurling boulders, and, of course, the peril of Bilbo’s riddle game with Gollum and the forfeiture of his life if he were to lose. Since we are so familiar with many of the characters and the eventual ending-point of some of their paths due to the latter part of the story having been already told in the Lord of the Rings trilogy of films, it will be slightly anti-climatic knowing that certain characters can’t die. Then again, this is also the case for everyone who has already read the series of books. I am still beyond delighted and ecstatic to be heading back to the world in which director Peter Jackson has created films with so much heart and majestic beauty that I am sure to be completely enthralled while watching it nonetheless. “The Hobbit: An Unexpected Journey” will be opening in theaters Dec. 14 in glorious IMAX, 3D, 2D and, in very select locations, in 48 fps 3D — the new way in which it was shot and meant to be seen. The enormous cast also includes Evangeline Lilly, Orlando Bloom, Ian Holm, Christopher Lee and many inspired new additions to the franchise. Does this trailer do anything for your expectations for this film or the trilogy being made from this singular book? Leave a comment and let us know your thoughts on the trailer and how you think the films will turn out, will they be everything that dedicated fans of these beloved books have been waiting for?